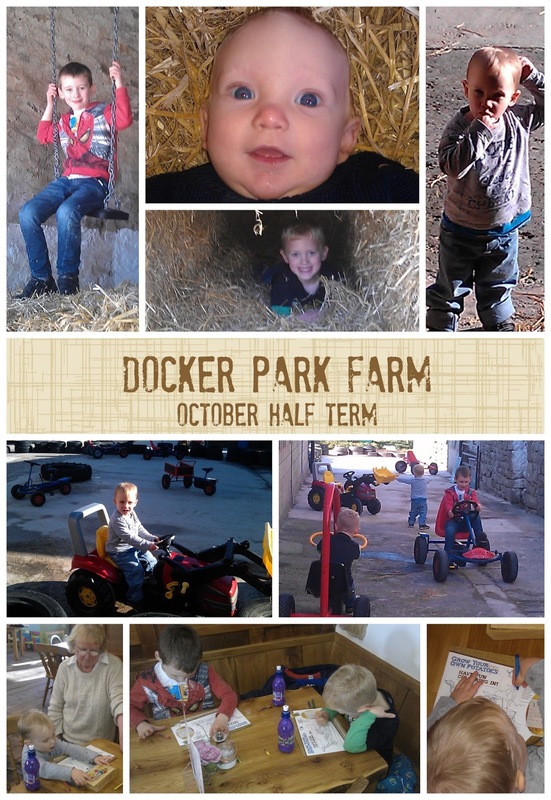 We went to Docker Park Farm this Summer and the kids had an awesome time, so I had promised them a return trip at Half Term. This time Nana came with us, and because it's Autumn now - and dark and damp - the prices are slashed. Adults go free, and kids aged 2+ are only £5! The paddocks are closed at this time of year, but the play areas are still open and you can still visit the pigs, goats, and petting zoo animals. These are my boys favourite parts so it's perfect for us. We were lucky to have a bright and sunny, if cool day. But it wouldn't have mattered if it had been pouring with rain because pretty much everything is under cover. The boys had a brilliant time playing in the barns and riding about on the tractors. Me and Mum managed to sit back and relax with a couple of extremely nice coffees and catch up on all the gossip confident that the boys were adventuring in safety. We did also treat them to lunch in the cafe - the food is lovely - and they had a play with some of the toys in there and did word searches and puzzles in the warm. Jack even managed to lean a new word: chitting (we had to Google that). Mum and I spoiled our selves with a slice of home made pumpkin pie, which was just delicious! It's a brilliant day out. And if you managed to get there on Halloween this year they are having a Halloween Crafts day - at no extra cost. This isn't a paid or compensated review.